Support for the CSBE graywater reuse project has been provided by a grant from the Enhanced Productivity Program at the Jordanian Ministry of Planning . Additional support has been provided by the Small Grants Scheme at the British Embassy in Amman . It is widely agreed that Jordan will face increasingly acute water difficulties during the coming years. Recognition is growing that a ‘business as usual' approach is no longer an option, and that issues related to both increasing supply and reducing demand must be seriously addressed. The Center for the Study of the Built Environment (CSBE) is implementing a project that aims at investigating, implementing, and promoting graywater reuse at the small and medium scales in the domestic and service sector context. Graywater is the output from bathtubs, showers, sinks, and washing machines, which although soiled, is not as contaminated as toilet water. As such it can be relatively easily treated on-site for reuse in non-potable contexts such as toilet flushing and garden irrigation. Any graywater that can be recovered and reused reduces the overall water demand accordingly, and saves on water bills. Studies in other countries have estimated that the domestic graywater resource could amount to as much as 35% of the total domestic demand. The project was initiated in September 2002 and will continue until June 2004. The project will consist of several components. It will examine existing applications of graywater reuse in other countries, and evaluate their technical, social, and economic feasibility. Also, it will investigate the social, economic, climatic, and other environmental factors that may have a bearing on the implementation of graywater reuse systems in Jordan, and will develop, in conjunction with Jordanian professionals, graywater solutions suited to the particular context of Jordan. The results will allow CSBE to provide technical advice that would support the implementation of a number of graywater reuse systems and schemes in both urban and rural areas in Jordan. The project also will include the dissemination of practical information on graywater reuse to developers, construction professionals, and the interested public through printed materials and through the CSBE web site. Click here to view photographs of and information on a simple graywater demonstration filtering unit for low-water-use houses, which CSBE has developed and is currently testing. CSBE would like to thank Richard G. Brittain, Assistant Research Professor at the School of Architecture at the University of Arizona in Tucson, and Val L. Little, Manager of the Water Conservation Alliance of Southern Arizona, for the invaluable help and support they have provided for this project. Also, special thanks are due to Mr. Shuja' al-Asad for his invaluable help in editing the Arabic-language publications for the project on a pro bono basis. A book published by Practical Action Publishing (2010) and edited by Stephen McIlwaine, director of CSBE, and Mark Redwood, program leader at International Development Research Centre (IDRC). This book examines technical approaches to treating and using greywater for irrigation, non-technical issues influencing the effectiveness of greywater use, and economic as well as policy issues relating to the sustainability of greywater use. The book is available from the publisher and online booksellers. An electronic version of the book is available from the IDRC web site. 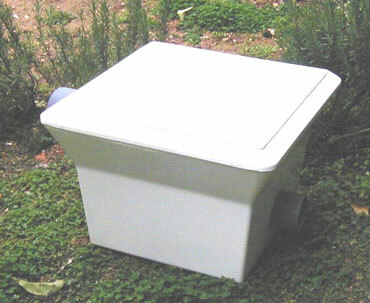 This is a simple graywater demonstration filtering unit for low-water-use residences, which CSBE developed in March 2003 and is currently testing. The unit is manufactured from fiberglass and measures approximately 30 X 30 X 30 cm. It provides for direct transmission of the graywater from the residence's graywater pipes into a garden irrigation hose or network, via a perforated surface, which acts as a basic filter. It is cheap, locally manufactured, easy to maintain, and involves no electricity or pumping, provided the land to be irrigated lies below the graywater pipe outlet. There are many ways through which such a unit may be further adapted to suit particular contexts. 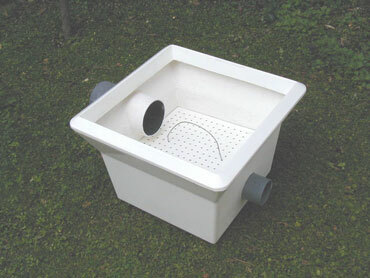 In fact, this demonstration unit expresses an approach for the reuse of graywater rather than a fixed solution. It therefore does not necessarily have to be constructed out of fiberglass, but also can be constructed out of concrete or steel, depending on the availability and cost of materials. Additional information regarding the unit will be made available as further testing of it is carried out.